I’ve been terribly backwards with my medieval sewing, making the gown, veil, belt and circlet, but not a proper shift (the nettle shift doesn’t really count). It was so easy to skip the shift when I could get away with using one of my 18th c shifts, but the problem with using 18th c shifts is that they have 3/4 length sleeves, which get caught beneath the long medieval sleeves, and make a horribly bulky line on your arm. So a medieval shift was a must, and I’ve actually been working on one for over a year, doing bits of hand-sewing whenever I had a plane ride or a lecture to attend. This shift didn’t make either long trip to the US, as it had too little left to do to, and would have ended up done, and useless weight in my luggage, far too soon. But it did get finished over New Years, though when I tried it on in preparation for the Levin Medieval Market, the neckline was a bit high, so I had to cut it down and re-do it. I know. This has got to rate as the most boring thing I’ve photographed yet. Even worse than the not-exciting petticoat. The only thing slightly interesting about this shift is that, because it was sewn mostly on airplanes, and I didn’t have a lot of space to figure out exactly what was going on without seriously annoying my seatmates, the seams are all sewn in different directions, with half of them being flat felled to one side, and half to the other, leaving no proper ‘right’s side to the shift. 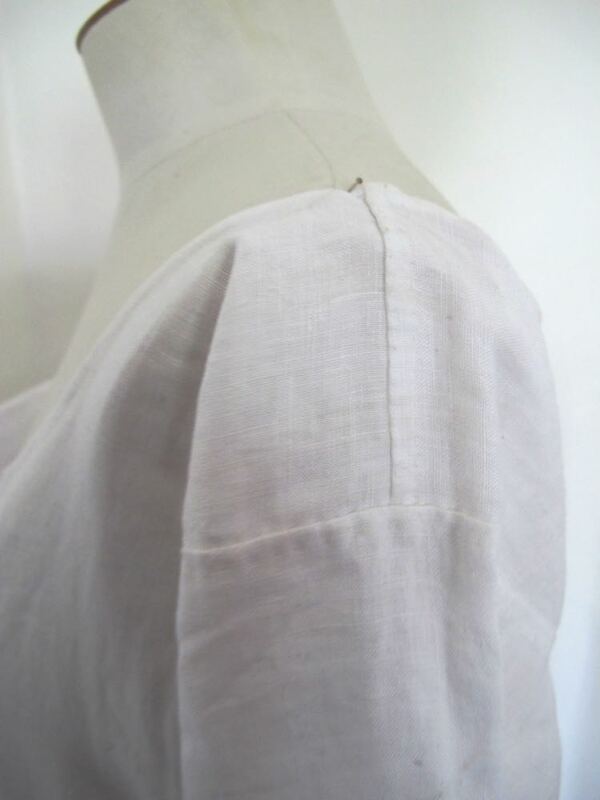 I even managed to hem the sleeves and hem to one side of the fabric, and the neck to the other. Le sigh. 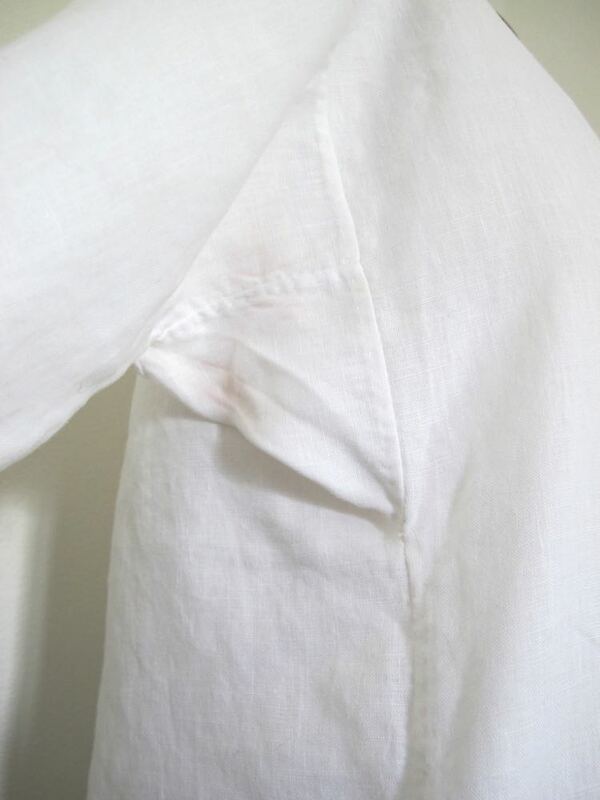 (and yes, it has been worn, and hasn’t yet been washed, so it has slight grubbiness where the cuffs showed, and the red of my gown rubbed off under the arms). But, it was very comfortable to wear all day in summer heat, and provided a nice cool layer beneath the wool of my dress. Next time I’ll make the sleeves a bit narrower, and try to get the seams all facing the right way, but for now, I’m very happy with my shift. Pattern: None, just using basic geometry to make a standard shift pattern. How historically accurate is it? Unfortunately I didn’t take research notes on it, and it took so long to make I can’t remember how accurate my pattern was, or if I just did a quick adaption from 18th c, so it’s hard to determine. 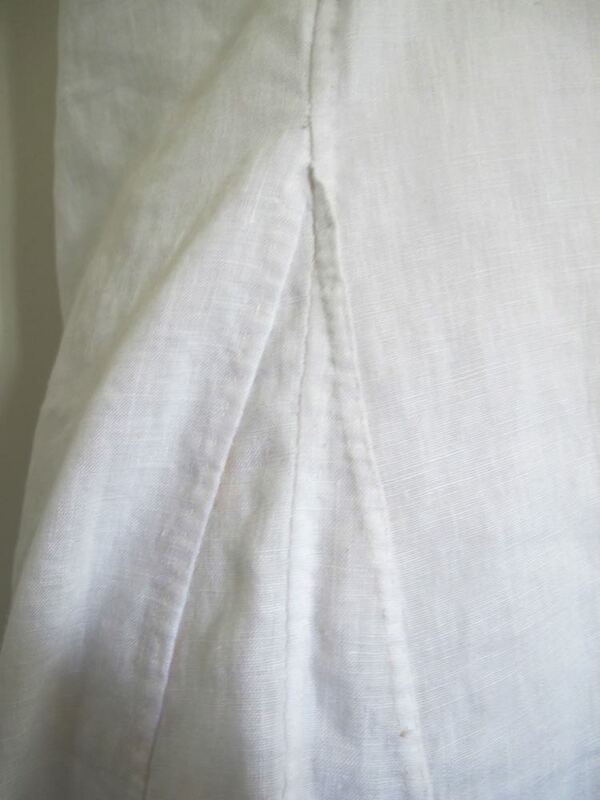 The fabric, construction methods, and stitching are all documented. Since we didn’t have a proper one, and since this may rank as the least interesting post I’ve ever written, it’s going to serve as the link post for the HSM 2017 Firsts and Lasts challenge, so that at least if my shift isn’t enthrallingly interesting, you can go down to the comments and find links to other people’s far more interesting projects! So, if you did make something for Challenge #1, please leave a comment with a link, so we can go admire your make! 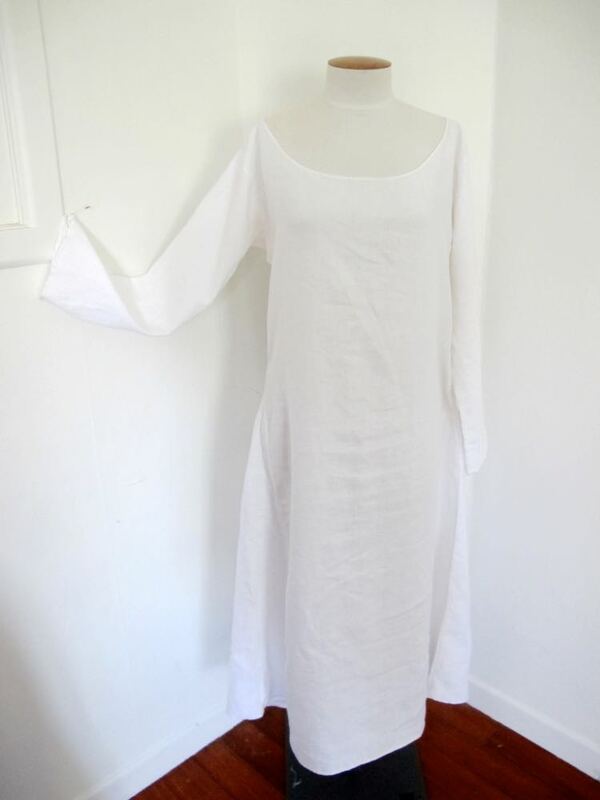 Maybe a plain white shift doesn’t make an exciting photograph, but the neckline is lovely – your re-done things turn out so well! I’ve done several of these (with different necklines) and they are boring but a great place to practice different kinds of construction stitches! 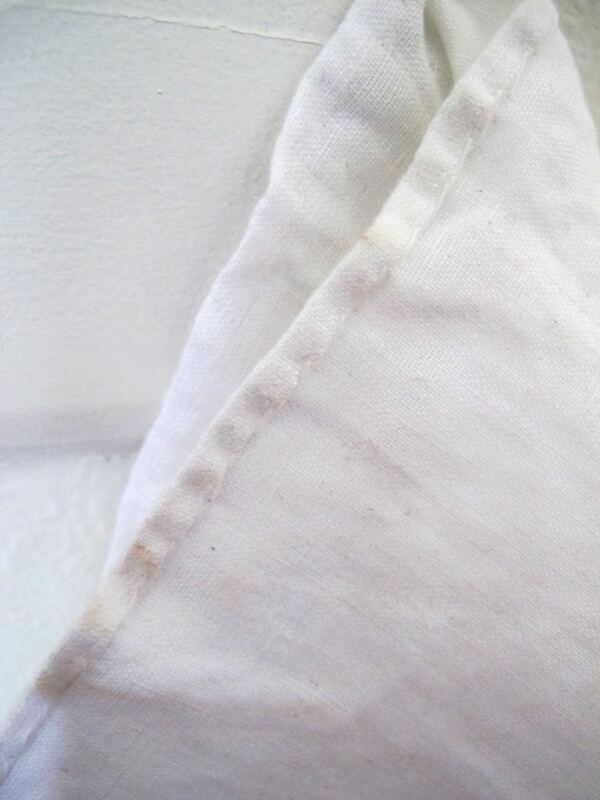 The top of your side gussets look lovely and neat – maybe I should have tried flat-felling mine in different directions! I wear mine both ways out too, and if I’d thought to have a suitable neckline I could have worn it pretty much any way it went on. Maybe not as glamorous as a pretty dress, but it’s a good shift and it did a great job in Levin. Things like this are so satisfying when you finally get them done. Did I miss the list of challenges for this year somewhere? Click on the HSM logo on the right side. It’ll take you to the list: http://thedreamstress.com/the-historical-sew-monthly-2017/.